Kouvola 8-9:th of November 2003. 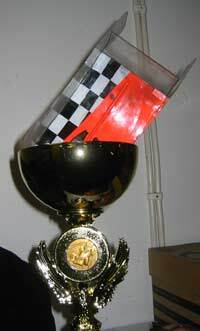 Kouvola, Finland, hosted racing on their super fast Hasse King. The place is neat and clean. As you can see, small details like the carpet on the walking bridge, gives good impression. Saturday started with the one motor G-7 race. Anders Gustafson took an initial lead but in the fourth heat he lost a magnet and continued to race more than four heats with one magnet missing. Mikael Silén, who was chasing Anders, took over the lead and with high pace he stormed away to an easy win. 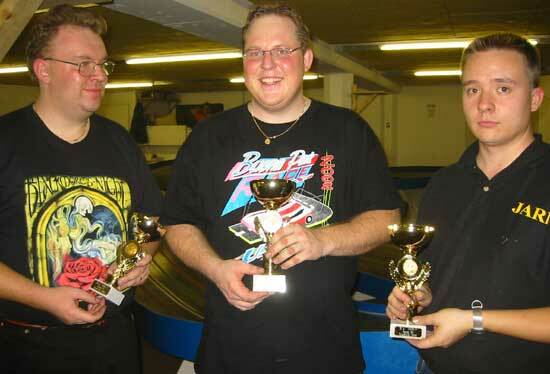 In second place was Jari Portinen and in third Juha Yli-Sipola. From left to right. Juha Yli-Sipola, Mikael Silén and Jari Porttinen. Early on Mikael had some trouble after his car got stuck in one af the marshal's T-shirt. 1,791. Pekka Sippola was second with 1,833 and Jari Porttinen third 1,839. In the main Anders Gustafson took the lead closely followed by the pack. After a few heat Jari Porttinen was in the top. Mikael Silén, who had a bad start, was going faster and faster and in the last heat he grabbed the third spot. 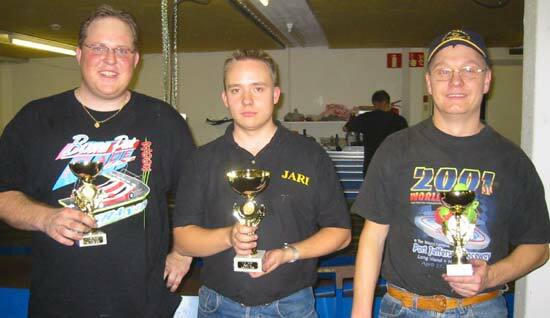 These two drivers, Jari and Mikael, were the only ones to do more than 100 laps in a heat. 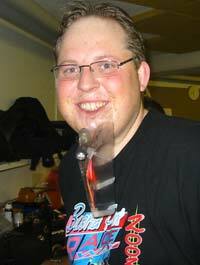 Anders Gustafson took third place.